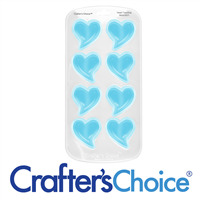 Add some love to your soap design with this mini heart silicone soap mold. We love the ideas of using this inside the gingerbread man mold or using a bunch inside the large heart mold. Use your artistry to craft a beautiful soap for Valentine’s Day or a wedding. Bar Cavities: 1 Bar Length: 0.625"
Melt & Pour Soap: Close the mold by firmly pressing the edges together. Stand the mold in a sturdy measuring cup. Slowly pour melted soap into mold, and allow soap to harden. Open mold and remove soap. Trim edges with a potato peeler or spatula. Embed mini column into a loaf. Embed multiple mini columns for a unique design. Cold Process Soap: Close the mold by firmly pressing the edges together. Stand the mold in a sturdy measuring cup. Slowly pour traced soap into mold. After at least 24 hours, open mold and remove soap with gloved hands. Trim edges with a potato peeler or spatula. Embed soap into a loaf. Allow soap to cure for 4-8 weeks. Note that some cp soap recipes may require a week to harden enough to remove from the mold. If this is the case with your recipe, we recommend adding sodium lactate to your recipe to assist with creating a harder bar faster. COMMENTS: This mini heart column mold makes tiny hearts when cut up, they're about the size of a dime. Great for embeds! • I wish it was longer! COMMENTS: Working great for embeds. This is tiny so if you want something larger go with the larger one. Otherwise this is a great product. COMMENTS: I enjoyed the ease of this mold. It did require a bit of a clean up on the edges from a little leaking under the closure but a simple knife down the seam was easy. COMMENTS: Love this handy mold for embeds. COMMENTS: This mold is very necessary and super practical. The price is pretty good also. It is very useful to start practicing how to embedded objects. COMMENTS: I used for embeds in my melt and pour and CP soaps. Very easy to use. COMMENTS: Love this mini heart to embed in my cold process soap. This was easier to use than I expected! I may have to get a few more. So cute and dainty. But most importantly, good quality. No leaking. Sides snap together with ease and secure the batter inside! Thank you WSP! COMMENTS: I had been so excited to receive this product, but I was disappointed in the size. It really is mini size. It's dimentions are true to size I just hadn't realized how small they were. I have used it to make single use hand soaps and that works well. I would definitely recommend buying the larger size heart column though if you are intending to make average size soap bars. COMMENTS: I made my heart mold with melt and pour and made several to put into a white base melt and pour in a short tall and skinny mold. They fit perfectly with out having to cut them at all. The silicone mold is great. No difficulty using the mold at all. It works well and doesnt leak at all. Great mold, i got to buy more of them. This is a small, petite heart mold. Works great. And looked fabulous in my soap, everyone just loved it. COMMENTS: I really do love the silicone molds but honestly this one I think may be defective...The heart shape so far has not lined up quite right and its very very small...I'm kinda disappointed in this one. "Easy to use, great mold!" COMMENTS: I love this mold, it is easy to use and came out perfect with little effort! What more could you ask for? :-) Everyone loved the look of my finished soap with this mold, Wonderful product, I recommend it! • Easy use, perfect heart every time. COMMENTS: I expected a little bit larger mold...plus does not close tidly, I had to use binder clips to hold the glycerin, otherwise the melted glycerin start spreading out of the mold. WSP Response: When pouring glycerin soap into a column mold the temperature should be around 125-130°F which help the soap from spreading out of the mold. COMMENTS: This tiny heart is very cute! The mold is easy to put together, and take apart. Also very easy to clean! COMMENTS: I adore this mold. I have made many hearts and have colored them different colors and added them to a white base CP soap. Just amazing. I have also used the LS M&P and added those to a white base CP.. another beautiful saop! • Easy to remove soap and no leaking!! COMMENTS: I use this mold to embed hearts in a couple of my soaps. It ends up being a great size and the soaps sell great. My only issue is that you have to use binder clips to keep the mold closed when you pour in the soap and while it cures. COMMENTS: I use this mold for embed mini heart in my soap CP. The best way it works is using a formula that harden very well then the shape will be well defined. COMMENTS: I love these molds! • Ease of use and washing. COMMENTS: I use this to make embeds for my cp soap. The mold holds up well, and there is no problem unmolding the soap. Embeds are small enough to use in guest-size soaps for wedding favors. COMMENTS: This mold fit together well, and I had no need for rubberbanding it. I would use it again. Liked results. "So far my favorite mold EVER!!" COMMENTS: I have used this mold to make inbeds over and over since I got it. I have a few other in beds, but now I have enough heart sticks to make at least 5 3lb loaves of soap! I have made them in all colors, some with glitter, some transluscent, some solid colors! I love, love, love it! Why are the other small column molds not out yet though??? I am dying for a couple of more shapes????? WSP Response: We are just waiting for the final inspection and testing to be done...stay tuned! They should be released soon. • pressure your suppliers about others!! COMMENTS: I love this little heart mold. It is perfect for making little hearts of course to put in to soap later on. I can see I am going to have loads of fun with it. COMMENTS: When this first came I thought " oh no, it's REAL tiny!" It's going to take forever to make my embeds. I was wrong. Dead wrong. Yes it holds just shy of an ounce but I can fill it & put it in the freezer for a minute maybe 3 max if I poured really hot and I can take the little guy out. There is a bit of cleanup but it's very easy. The mold is ready to go in a few seconds again. I did a rainbow progression roygbiv style just changing colors and by adding the next colour in progression to what was left over in my heating cup. Blasted thru it quickly. By the time I cut more mp & mixed in color the mold was ready to come out give or take. Even if you take it out a little wiggly it's small enough to easily lay straight. I want all of these little guys, like right now!!! COMMENTS: This is just the cutest little mold! I'm using it to make embeds out of melt n pour soap to put in cp soap and they came out very good. My only complaint is the alignment; it's just a little off but not a major issue. "I've checked and double checked the dimensions, but I still don't see how long the entire mold is. Is it 8" long so that one column of soap from this mold fits exactly into a 1501 loaf mold? I think you could make the description a little more detailed. Thanks!" Staff Answer Yes, all of the column molds are designed to fit into the 1501 loaf mold. They may to be trimmed slightly but they are made to fit snuggly into the silicone loaf mold. We will add additional information to our description so this is more understandable. Thanks for bringing to our attention. "Are these small enough that you could make these hearts and fit them into the LARGER heart mold as imbeds in that mold? 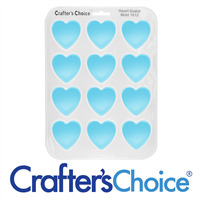 Could three of the mini column hearts fit in the larger column heart mold? Thank you." Staff Answer Yes three of the Heart Mini Column Silicone Soap Mold 2014 hearts would fit easily inside of our Heart Column Silicone Soap Mold 2001. "What is the dimension of this mold? How many ounces does it hold?" Staff Answer The dimensions have been added to the Additional information page for this product on our website. This mold will hold 0.9oz by weight.